This year marks the 10th anniversary of Marvel Studios. 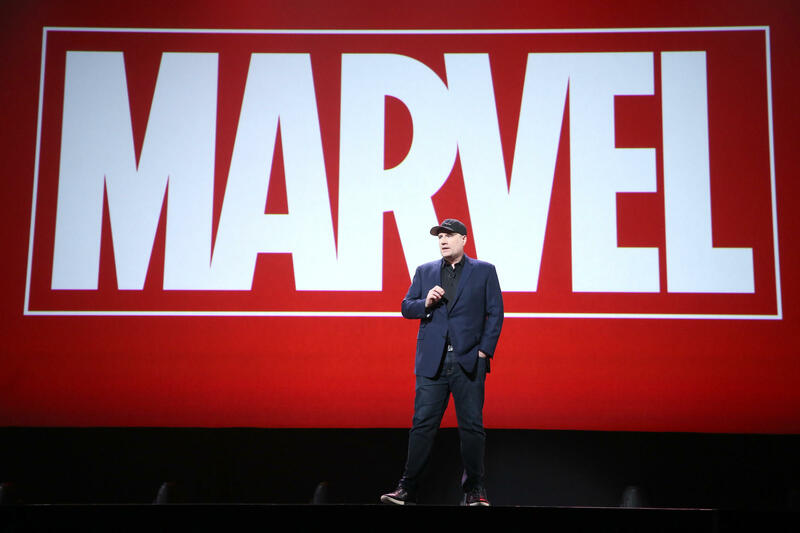 Here, Marvel Studios President Kevin Feige presents at the 2015 D23 Expo in California. Feige (pictured here in 2017) says, "All of us at Marvel Studios look at ourselves as fans first. That's what we were before we were filmmakers." Kevin Feige runs the Marvel Cinematic Universe from his corner office at the Walt Disney Studios in Burbank, Calif. There, the president of Marvel Studios is surrounded by toys: Iron Man action figures (signed by director Jon Favreau) line the windows, Captain America's shield is framed on the wall and Thor's hammer rests on the coffee table. Before our interview, Feige puts his hand in a replica of Thanos' Infinity Gauntlet (which plays a central role in the new Avengers movie) — and chuckles like a big kid. "All of us at Marvel Studios look at ourselves as fans first," he says. "That's what we were before we were filmmakers." Over 18 years, Feige has produced a lot of Marvel movies. His credits start with the first X-Men in 2000, and go all the way through Avengers: Infinity War, out this week. "A producer does nothing and everything," he says. "Nothing, in that we don't write, not directing, not sitting at the Avid — the editing machine — but working with all those people and collaborating with all those people. And at the end of the day, the job, I believe, of a creative producer is to see the project through from the initial idea." [It comes] directly from the comic books, and the notion of a shared, ongoing, fictional narrative with characters inhabiting the same shared universe — which meant Spider-Man could pop up in Thor's comic, and Hulk could come running through the streets through an Iron Man comic. That is what was great about the Marvel Universe. And up until 2008, that hadn't been possible in movies. I'd worked on a number of movies before we started Marvel Studios ... but all of them, in those movies, Spider-Man was the only hero in that world; the X-Men were the only heroes in that world; Daredevil; Fantastic Four. They inhabited a world where they were the single extraordinary element. And that really wasn't what the Marvel Universe was all about. It was about all of these characters, inhabiting the same world. The key job of the directors we hire, of the writers we work with, of the actors that we hire and work with, is to make a character who seemingly isn't that relatable — a billionaire genius industrialist, a World War II soldier who'd been frozen in ice for 70 years, a Norse god. How do you make them relatable? That's the job. So as we work on each film, we try to find the humanity in them. A lot of that is right there in the comics to pull from. But we start to find ourselves identifying with each one that we're making at the time, because that's how we believe the audience will as well. ... We try to instill a little bit of ourselves in all of them, in the hopes that the audience will then see themselves on the screen. It's a group decision within Marvel Studios. ... We knew how you could build a machine that could make something that looks really big and impressive. What we want and what we need the filmmakers to do ... [is] take those groups of artists who know how to do this amazing spectacle on a big canvas, and bring a very personal touch to it, and bring a unique vision to it. It's looking for people that, yes, share a love of what we are trying to accomplish. If there is a cynicism about "comic book movies" or "studio movies," we're not interested, because we're not cynical about it. And we think these movies can be the best movies being made, even with spaceships and even with capes and even with superpowers. So assuming we're on the same page in that regard, you look for people who have a unique viewpoint. And that might be from their upbringing, that might be where they're from, that might be the kind of questions they're asking in their own lives. Black Panther was a great example of that, behind the scenes. Captain Marvel [starring Brie Larson], which is shooting literally right this second with Anna Boden and her partner, Ryan Fleck, directing. We have films that we haven't announced yet, with filmmakers that we haven't announced yet, that we'll continue to see. I've said that Black Panther will not be a one-off for us — it will be the beginning of something we believe in very deeply, have always believed in, and that our bosses at the Walt Disney Company believe in and encourage, which is the movies should represent the world in which they are made, and should be made by people that exist in the world and that bring new stories to it. And boy does Black Panther showcase, beyond our wildest dreams, the best of what can happen. The notion of more female leads, more people of color leads, that is 100 percent the future — I think the future of all film, certainly the future of Marvel Studios films. Nina Gregory and Nicole Cohen edited this story. "Avengers: Infinity War" may break box-office records when it opens this weekend, has a chance to anyway. Its over the top all-star cast includes Robert Downey Jr., Scarlett Johansson, Benedict Cumberbatch and Chadwick Boseman. They team up against super villain Thanos played by Josh Brolin. JOSH BROLIN: (As Thanos) This (laughter) does put a smile on my face. INSKEEP: OK. The man who shaped this cinematic universe for the past 10 years is Kevin Feige, the president of Marvel Studios. NPR's Mandalit del Barco offers this profile of the "Avengers'" head honcho. MANDALIT DEL BARCO, BYLINE: The nerve center of Marvel's Cinematic Universe can be found in Kevin Feige's corner office on the Walt Disney Studios lot in Burbank. Here, he's surrounded by toys. Iron Man figures line the windowsills. Captain America's shield is framed on the wall. Thor's hammer rests on the coffee table. Feige lights up as he dons Marvel's most-powerful weapon. KEVIN FEIGE: This is the greatest toy that we've made. This is Thanos's Infinity Gauntlet. It's pretty cool. DEL BARCO: Whether it's playing with toys or overseeing interconnected superhero blockbusters, Feige says he sees himself as a fan first. He delights in a young fan's question. OZZIE BATES: Hello. I am Ozzie Bates (ph). I want to know if Thanos kills Vision. FEIGE: It's an excellent question because Thanos is in search of all of the Infinity Stones. And our 8-year-old friend there is well aware that Vision has one of those Infinity Stones in his head. DEL BARCO: For the past decade, Feige has presided over 19 Marvel films that have an average global box office of more than $820 million. From the original comic books, he took the idea of mashing up all the superheroes in the same movies. FEIGE: The notion of a shared ongoing fictional narrative with characters inhabiting the same shared universe. Spiderman could pop up in Thor's comic, and Hulk could come running through the street through an Iron Man comic. That is what was great about the Marvel Universe. BEN FRITZ: Having somebody who knows and respects the comic books who is a nerd is actually an asset. DEL BARCO: Journalist Ben Fritz is the author of the new book "The Big Picture: The Fight For The Future Of Movies." FRITZ: Kevin Feige is rare breed where he's both a corporate executive and a creative producer. He's managed to balance being this seemingly affable fanboy with also being a very successful executive in an industry where the corporate politics are vicious. DEL BARCO: The chairman of the Walt Disney Studios, Alan Horn, says Feige has an innate sense of story and what is commercially viable. He marvels at how Feige manages to keep track of the complicated franchises. ALAN HORN: The sheer logistical challenge of managing all of those superheroes is really a challenge and would be, I would say, daunting. But I find he's always calm. He's undaunted. 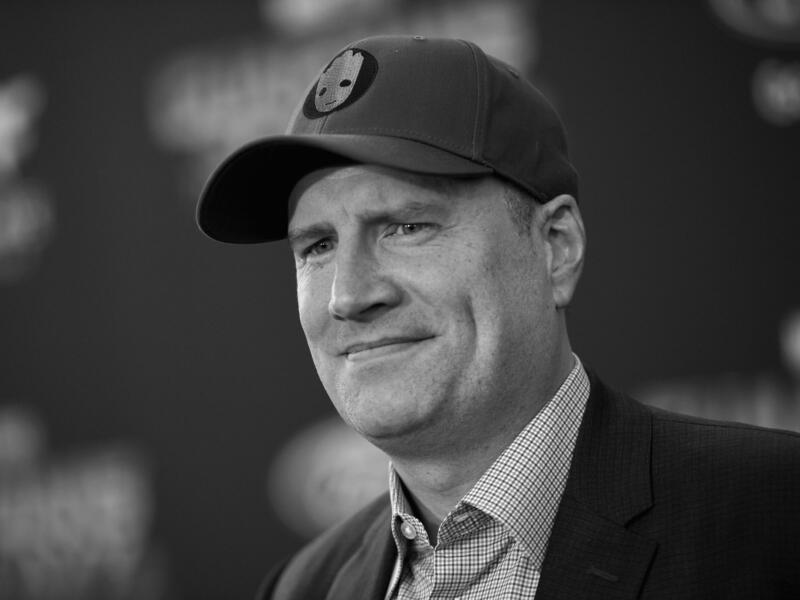 DEL BARCO: The 44-year-old Feige grew up in New Jersey watching movies, reading comic books and playing with action figures. Then he headed to LA, where he started out as a production assistant. FEIGE: Within the first couple of weeks of moving from New Jersey to Hollywood, I was in the back seat of a film student's car driving out to the desert to PA on a 2-minute student film. I thought I'd made it. I thought I had reached the pinnacle of success in Hollywood. I couldn't believe. DEL BARCO: After five rejections, Feige got into film school at USC. And soon, he was washing cars and taking lunch orders on the Warner Brothers lot. He worked his way up to get an associate producer credit on the first "X-Men" film with 20th Century Fox. In 2008, after working on more superhero movies, he became the hands-on president of the newly-formed Marvel Studios. Feige ushered in Marvel's signature cliffhangers at the end of the first "Iron Man" movie. After the credits, Samuel Jackson came on screen as Nick Fury to school Tony Stark. SAMUEL L. JACKSON: (As Nick Fury) You think you're the only superhero in the world? Mr. Stark, you've become part of a bigger universe. You just don't know it yet. JON FAVREAU: We were able to surprise people. And in each successive iteration since then, those expectations have risen. DEL BARCO: Jon Favreau directed the first "Iron Man." He tips his hat to Feige for evolving the Marvel movies from "Iron Man" to the culturally and financially successful "Black Panther" to this newest film. FAVREAU: What started off as something we were feeling our way through turned into a set of techniques and formulas for approaching the material in a way that created tremendous consistency and also left a lot of room for originality and input from new partnerships and new filmmakers. So everybody was able to leave their stamp on it, but yet the whole thing feels consistent. DEL BARCO: Kevin Feige says he looks for directors who, like him, are not cynical about comic books or movie toys, directors with unique voices. FEIGE: Most recently with "Black Panther," Ryan Coogler, 31-year-old filmmaking genius, was able to step in with us at Marvel Studios and answer questions he's been struggling with his whole life and bring a extremely personal touch to that film while at the same time having armored rhinos run across Wakandan fields and armies blast vibranium weapons at each other. DEL BARCO: He says the key job of Marvel's directors, writers and actors is to make the characters accessible. FEIGE: A billionaire genius industrialist, a World War II soldier who'd been frozen in ice for 70 years, a Norse god. How do you make them relatable? That's the job. We try to find the humanity in them. A lot of that is right there in the comics to pull from. You know, we try to instill a little bit of ourselves in all of them. SCARLETT JOHANSSON: He really is a kid at heart. DEL BARCO: Scarlett Johansson, who plays superhero Black Widow, shares a passion for Marvel's baseball-cap-wearing leader. JOHANSSON: Kevin seems to have limitless enthusiasm, energy and vision. And he has a lot of humility. He may actually have the superpower of humility, I would say. DEL BARCO: At the "Avengers" premiere in Hollywood on Monday, actors Don Cheadle, Benedict Cumberbatch and Dave Bautista revealed more. DON CHEADLE: Kevin Feige's superpower is being an awesome goalkeeper. BENEDICT CUMBERBATCH: Being able to build an absolutely unique cinematic empire. DAVE BAUTISTA: He is a big old geek, and he just gets it. DEL BARCO: One of the biggest criticisms of the Marvel Cinematic Universe has been the exclusion of women on screen and behind the camera. Feige says that's changing. Next up for Marvel is "Ant-Man And The Wasp," followed by "Captain Marvel," starring Brie Larson. Feige says no matter how many films they announce, fans always want more. FEIGE: In the case of "Black Panther," literally the Monday after "Panther" opened, people start asking, where's the Shuri movie? Are you going to do a Shuri movie? That's the greatest thing in the world. So believe me, we think about all those things. And we have plans for the characters. And the notion of more female leads, more people of color leads, that is 100 percent the future, I think the future of all films, certainly the future of Marvel Studios. (SOUNDBITE OF ALAN SILVESTRI'S "THE AVENGERS") Transcript provided by NPR, Copyright NPR.